Hope your week is off to a great start! 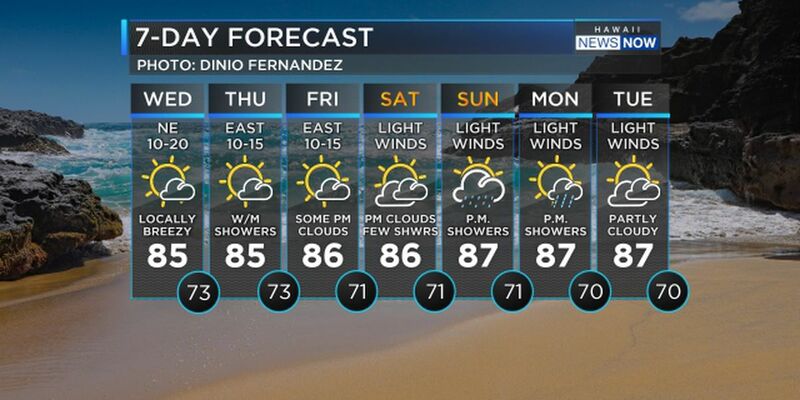 The high pressure fan northwest of the islands will move southeast and weaken. A band of showers east of the islands will weaken and move off to the east. The trailing end of a front over Kauai will move southeast through mid-week dropping light showers along the way. As we head into midweek, an upper level disturbance will provide very cold air aloft and with the contrast in temperatures from above to the surface- it can trigger thunderstorms especially near Maui County and Hawaii Island. The lingering moisture will also help enhance showers for parts of the state Tuesday into Wednesday. This will also trigger snow on Maui and Hawaii Island Summits above 9K ft. A winter storm watch will begin Tuesday evening into Wednesday afternoon. Surf continues to be on the rise as we track another winter swell. A new moderate mid-period northwest swell will be filling in through the day Monday. A larger long-period northwest swell will begin to fill in on Tuesday and peak Wednesday or Wednesday night near warning levels.The NWS will likely post an advisory for north and west facing shores beginning late Tuesday or Tuesday night into Wednesday, then to warning levels late Wednesday into Thursday as a large northwest swell builds down the island chain. Rough surf is expected Tuesday night through Thursday along north facing shores due to a combination of this large northwest swell, a large short-period north swell and strong onshore winds. Surf will gradually lower Friday into the weekend. 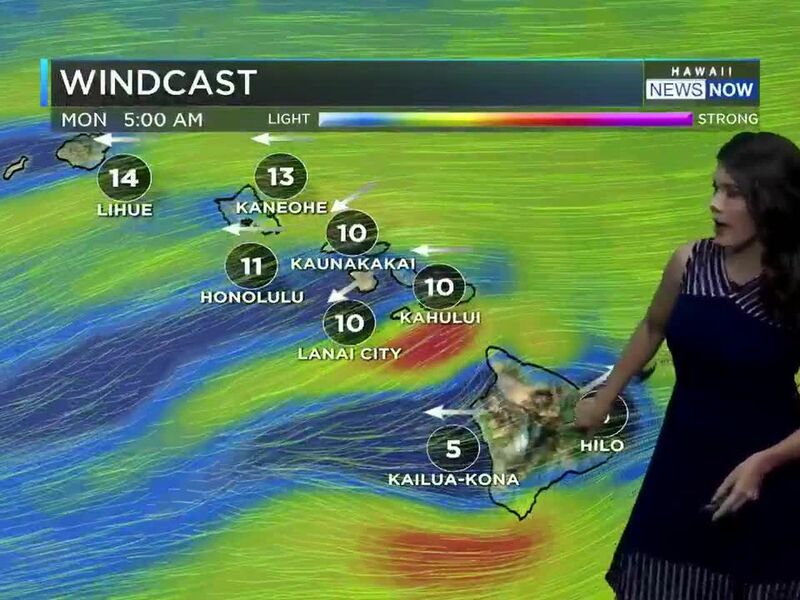 More settled weather and cool brisk northerly winds are expected for Wednesday into Thursday, followed by trade winds that will ease into the weekend. 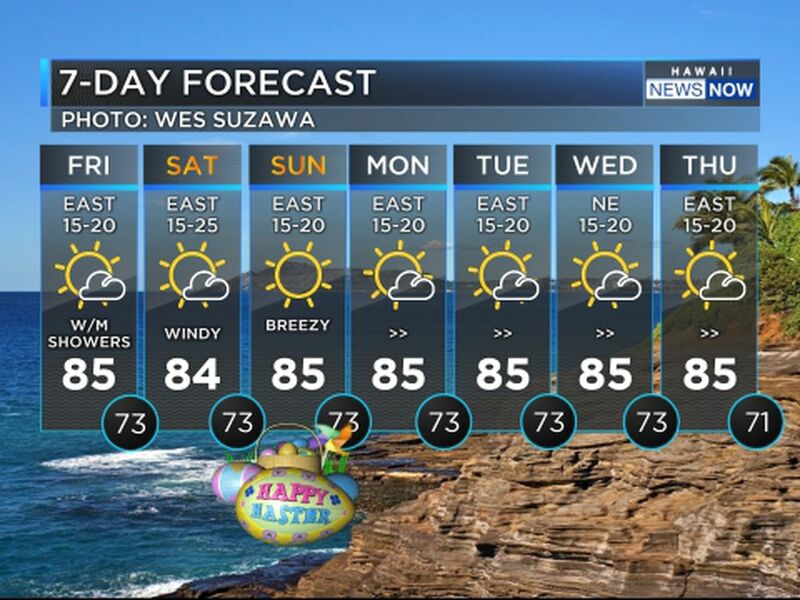 Nice trade wind weather for one more day as high pressure remains in place to the north. 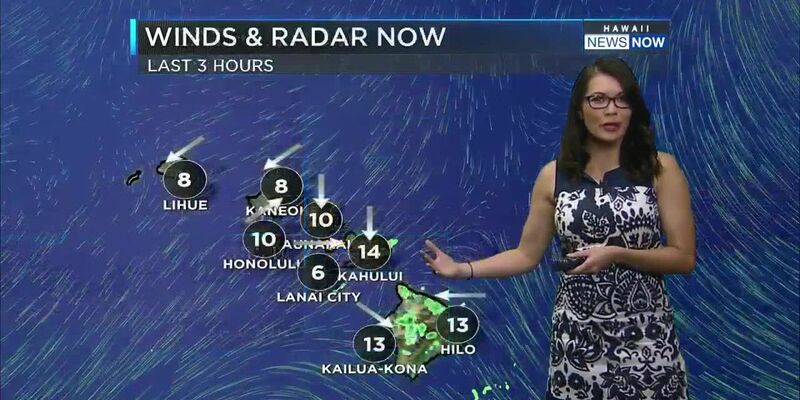 Only moderate nighttime and morning trade wind showers are expected for now.